I can hardly believe that I am discussing Christmas trees already. Time is undoubtedly relative and the yearly cycles only seem to speed up as my birthdays multiply. The girls in the office tell me there are 78 days to Christmas. Abbie, who is relatively new but remarkably well named, has been assigned the job of ordering Christmas trees and rang me to check how many smaller trees were needed to line the front drive and how many flank the Castle courtyard and various doorways. I replied “Abbie, we do need it to be nearer 18 foot or we are going to be cutting too much off – if it were 24 feet it would effectively be a man’s height taller. Just imagine John on top of the Christmas tree – it would be far too much. Sally would, I think, prefer the fairy option”. Sally from the gift shop tends to be in charge of Christmas. She and I sit down with the obligatory cappuccino to discuss the themes for this year’s tree and decorations. Once agreed, this is then Sally’s project and we all more or less fall into line and become her Christmas Elves. Traditionally everyone has to wear a silly Christmas sweater on the day of putting up the Castle tree, rather like the embarrassing one worn by Colin Firth on the first ‘Bridget Jones’ film. There are always some cringe-worthy entries and the competition is usually one by either won by Paul or Pat. One of my favourite winter events at the Castle is the Christmas Fair. This always takes place in the first week of December on the principle that I personally don’t like to begin Christmas in November. We invite various local trades and crafts people to join us to sell a myriad of items from home-wares, hats, and jewellery, to decorations, foods and wines. Our kitchen team fills the tearooms with mince pies, hot soups and Christmas quiches. Girlfriends wander down from London to see what they can achieve by buying Christmas gifts along perhaps with one or two items for themselves all while raising money for the Thames Valley Air Ambulance. We also open the Fair on the Wednesday evening in order to catch those unable to come during the day. I gather that men spend ridiculous sums of money on Christmas Eve, madly panic buying presents because Christmas once again has caught them by surprise, so I hoped that this evening opening was a way of exploring buying things that their loved ones might actually want. I realised this myself one year when Geordie staggered in on Christmas morning bearing something that seemed deliciously heavy for me to unwrap. Excited and mystified I found – a pestle and mortar. Completely lost for words, I looked at my husband who explained into the silence that on Christmas Eve the only department in Harrods which was not a terrible crush was the kitchen department. Since then he has avoided the kitchen department to everybody’s advantage. How wonderful it must be to see Highclere at Christmas. It sounds amazing. It is a beautiful time of years for the cedar trees and somehow snow just highlights the architecture of the castle. What a wonderful way to prepare for Christmass a lovely time of the year. We really enjoy it here, the warm weather, carols, and a Christmas Eve service. Plus I love to bake. I don’t like starting until December too but the shops here have already started!!!! Lol, your Geordie sounds like my husband when it comes to shopping! Oh! Please tell us more about your Christmas – anything! I just drool over the eye candy of the season. The very best of the holiday spirit to the “Highclere” family. It is hard to believe there are 78 days until Christmas. Christmas trees are on full display at local stores in Texas now. The holiday “season” seems to start earlier every year! Your Harrods gift story made me laugh! I can relate to that story so well!! Two years ago, my husband took me out to dinner to celebrate my birthday but forgot my birthday present. I celebrate a November birthday, so our shopping district was already decorated for the holidays. He walked me over to our local kitchen store, Sur La Table, and bought me a marble pastry board and rolling pin. Looking relieved, he said, “Of course I had it planned the whole time!” The cashier and I politely smiled. It was the heaviest panic gift I’ve ever received. Christmas, but I imagine you must need to plan a year in advance. My husband seeks for our tree all year! He just loves Christmas. Your festivities look so wonderful!! hang proudly on the tree) and a copy of your book!!! in good health and happiness! Thank you. Nicholas is a marvellous chap and so very talented. My husband Geordie has very much enjoyed working with him on the cigar project and we had a super time together at the UK launch here in the summer. Since I can no longer wrestle with Christmas trees, I went shopping for an artificial one that I can handle. Since I am a bit short in physical stature, I became disheartened, since the lovelier trees would require a ladder to decorate. Since my ladder is as rickety as I am, reality struck. I need a shorter tree. On a whim, I bought a 6 foot black tree. When I brought it home, my husband was appalled. He is traditional. I’m not. I decorated it with ornamental oddities that I have collected for years, such as a lady fish with long eyelashes, red pouty lips, and a purple purse; king and queen cats complete with crowns and regal robes; a pink flamingo complete with pink feathers; and silver and white ornaments. It is entertaining to watch the facial expressions of our guests. My tree always provides laughter and conversation. Oh, and I forgot to mention the green and smiling alligator wearing a pink feathered hat. So loved the pestle and mortar Christmas situation. In my mind’s eye, I can just see his face and yours too! I really enjoy your posts and pictures. I can imagine the wonderful Christmas atmosphere there. Truly enjoy the wonderful way you use your home for the enjoyment of yourself as well as others. Looking forward to the next post. Dear Lady Carnavon,. Hello from Brazil!Now that the first part of our election ended ,it is quite the time to think about Christmas!When I was a child,family with German traditions only displayed their Christmas tree on 24th December Eve…It was always a big surprise for the children and a heavy workshop for the adults of the house…Now,everything is prepared at least a month before.We Brazilians long for a White Christmas and sometimes we watch movies with Santa and lots of snow and even enjoy hot chocolate with milk,under 38 degrees Celsius,just to pretend it is cold outside…Can’t wait to see your beautiful home ready for Xmas!I love to read your blog! I tried going away one Christmas somewhere warm and it just felt out of kilter! Having said that I LOVE going away someway warm in a British February..
What a wonderful post. I enjoyed it highly while munching my breakfast cereal and drinking my breakfast tea. Just wanted you to know I bought myself a copy of the Christmas at Downton book to wrap and open on Christmas Eve. Buying presents for oneself is such a good idea! Today’s post was particularly charming and makes me long for Christmas at Highclere to a desperate degree. You may long for warmth and palm trees yourself–would you like to do a house swap? Just kidding, sort of . . .
Christmas at Highclere is always a special time of year and we so enjoy welcoming visitors into the warmth of the Saloon. This is the first blog of yours I have received since signing up, and you really do make the festivities seee alive! Happy Christmas to you and all your family and friends at Highclere Castle! I look forward to reading more of your blogs! I do also greatly enjoy the accompanying photos! Welcome Barbara! I do hope you enjoy reading my blog which I try to get out every Monday morning. As a writer it is a good discipline to have a deadline. It depends if you’ve been naughty or nice Paul! Oh, I distinctly recall that air of dislocation (only word for it, I suppose) regarding Christmas. 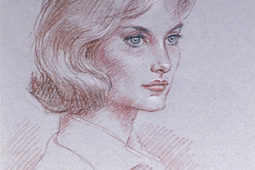 For years, my primary work as an illustrator was for newspapers and magazines. Advertisements, covers, editorial illustrations, etcetera. SO…….I usually spent September and early October burrowed down in my studio with fifty commissions, listening to Christmas music to “get in the mood”, and drawing/painting “Christmas” for two straight months. By the time the actual holiday arrived, I was already deep into Easter……eggs and tulips and sunshine and frolicking little lambs (all of which would be due by the first week of February). Welcome to the occupational hazards of being a commercial illustrator for magazines and newspapers. These days (which is to say, now that newspapers and magazines are either shuttered or invariably using stock-photography), I get to follow my own instincts……which are to “begin” Christmas (Decorating, etcetera) around the 20th. Hams and books and presents have to be ordered beforehand, of course……but the actual celebrating (at least in this household) doesn’t begin until Christmas Eve, and then I prolong it until 2 January or so. Luckily with my blog I am always writing about the current season but I do understand the incongruity of Christmas in sunny August (for those of us in the Northern Hemisphere anyway). I enjoy reading your blog and someday hope to Re visit the Castle. I was wondering if you can take care of diabetic person in the Dining room and otherwise. I hope to publish dome Diabetic recipes. With enough notice our talented Chef and his team can cater for a variety of special diets. It would be lovely to welcome you back to Highclere. I love the Christmas season, and your blog, has made me feel all warm and cosy. What a wonderful charity to raise money for, I always donate to our Yorkshire air ambulance, I did laugh about your wonderful present from Geordie, I bet your face was a picture. The doctors and pilots are such dedicated people and the Air Ambulances get no central funding so we try to do what we can to help. AWESOME! The magic of Christmas at Highclere Castle! What a wonderful thought. Would be marvelous to really see it all in person. I have such fond memories of my visit their in 2014 and hope to again step onto your British soil and experience the beauty of your country. Thank you for continuing to let us into your world. We’d love to welcome you again to Highclere. It is like a fantasy to have a chilly Christmas as here in Australia, of course, chilly days are now behind us for 2018. Spring is in full swing and showing her gorgeous self off quite brazenly. As here in Sourh Australia, more so than other areas of Australia, the first settlers were English free settlers, who on arrival purchased land outside the city. Most also had a city dwelling or a summer home in the cool of the Adelaide Hills. Their homes reflected those left behind and so came with these families, all the rich traditions of Christmas back home. My family have continued many of the loved traditions including the enormous Christmas dinner at 2pm with Roast turkey with all its treasured accompaniments followed by flaming Christmas pudding with Brandy butter and clotted cream. We still have the sixpences from our blissful childhood. However the day is often in the high 30+ degrees C. Younger families often celebrate with seafood, salads and fabulous Australian seasonal fruit. Thank you Jane – you describe such a wonderful, traditional Christmas day! This is truly an exciting time for your household!I wouldn’t be able to contain my excitement either as Christmas and the time leading up to it is my favorite time of the year.My mom and I kick off the season in November with baking traditional fruitcake from my grandmothers receipe.The house smells so scrumptious and invokes mememories of childhood Christmas past.Your space is so lovely and although it’s so very busy as it is a working household take time to Enjoy the twinkling lights and tea by the tree. I love how open you are about the events held at your home. Thank you for that. It is funny you bring up Christmas, I was just telling my wife last night once we become empty nesters (Got a few years to go LOL) I would love to see Highclere during the Holidays. Best of luck to you and lord Carnarvon, I am sure the Castle is going to look amazing! Then you must join us for the Christmas Fair!!! Today is Thanksgiving Day in Canada and I am making the pumpkin and lemon pies along with 3-buns (aka cloverleaf rolls) in my home while my youngest daughter is doing the turkey and fixings this year. I’ll be heading there shortly. I am very thankful for your generosity of spirit in sharing your lovely, lovely home with us all. I wonder about Christmas there. Do you decorate other rooms as well as the Saloon? Do you usually have snow? Are you able to carve out some quiet time for yourself in all the hectic lead up to the big day? Do you have turkey or goose? 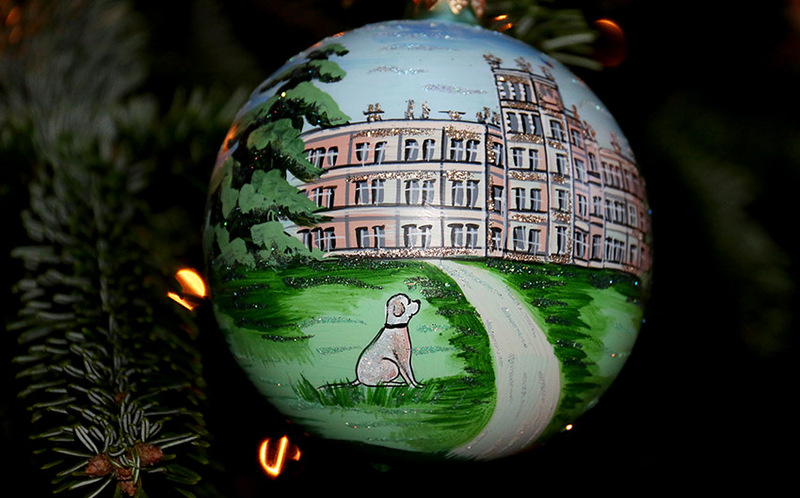 Have you published a Christmas at Highclere book? I should love to see the grounds and Saloon festooned for Christmas in glossy pages on my coffee table, connecting me in some small way to a place very dear to my heart. Blessings to you and your staff for the countless ways you give back to your community. We decorate the dining room and some of the Library as well AND I ma just writing my NEXT BOOK – it is the one you want!!! It is wonderful to see how the Castle gets together as a family to glorify and enjoy Christmas. It is the best part, it goes by so fast. You want to extend the last three months of the year. Along with, the smell of cinnamon and pies to start the new year. Thank you for sharing this lovely, warm time with us; that fills the air. And, doing so much to help others share and have fun. I wish you happy times to you and your loved ones. I SO-O-O- WISH I COULD BE THERE!! Christmas is my favorite time of year! I love it and all that goes along with it. How I would love to help decorate Highclere!!! I was a florist for over 40 years, so decorating is natural for me. When we still lived in Ohio, we had a larger house than we the one we have in Florida. I always put up 14 decorated trees, most with a theme. It was so gratifying to see the house come to life as a testament to the joy of the season. My kitchen was decorated in Pink and Black, so I found a pink tree and decorated it with black ornaments . It may sound gaudy, but it was so pretty! The tree in our main room, the living room was all clear lights, 244 crystal icicles, and blue glass ornaments. In that same room, we had a huge display of our Dickens Village houses and buildings complete with a mountain and a train running through the mountain! It was such fun. I still decorate here in Florida. Albeit on a much smaller scale. I do incorporate flamingos in my decor! Since reading your blog today, I have a new posting on my bucket list…to be at Highclere for Christmas . 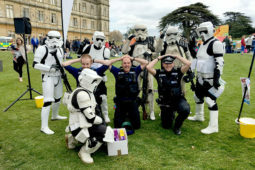 After being there for Heroes at Highclere, this year is not a possibility, but maybe 2019? One can dream! Thank you so much for sharing this happy plan with us. You made my day a happy one. December 2019 is a date! 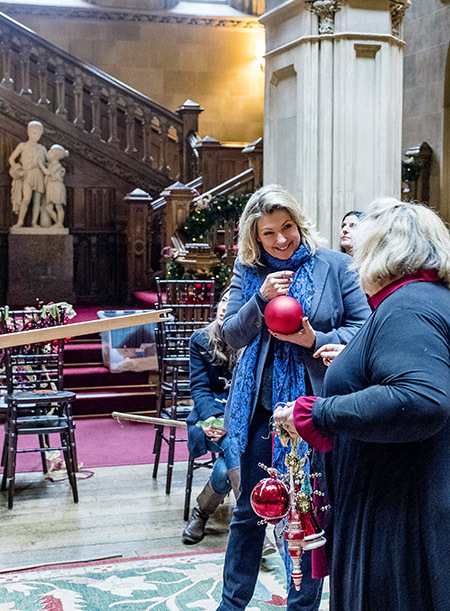 Oh what a nice blog about getting ready for Christmas at Highclere. 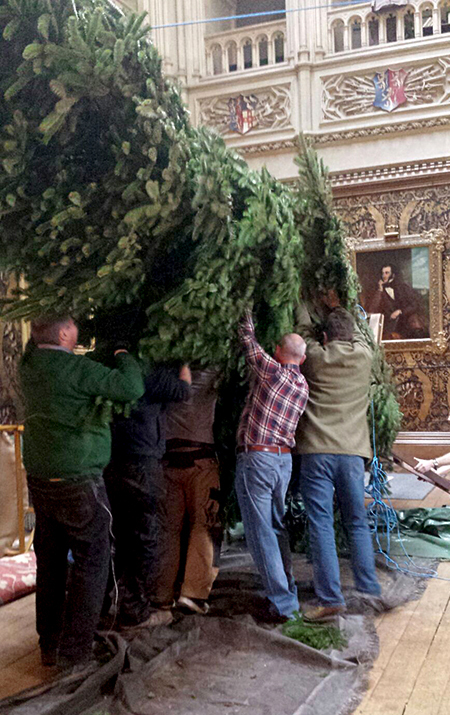 I love the photo of the men hauling in the big Christmas tree and the Third Earl (in the hanging portrait painting) seemingly keeping a watchful eye on the whole event! 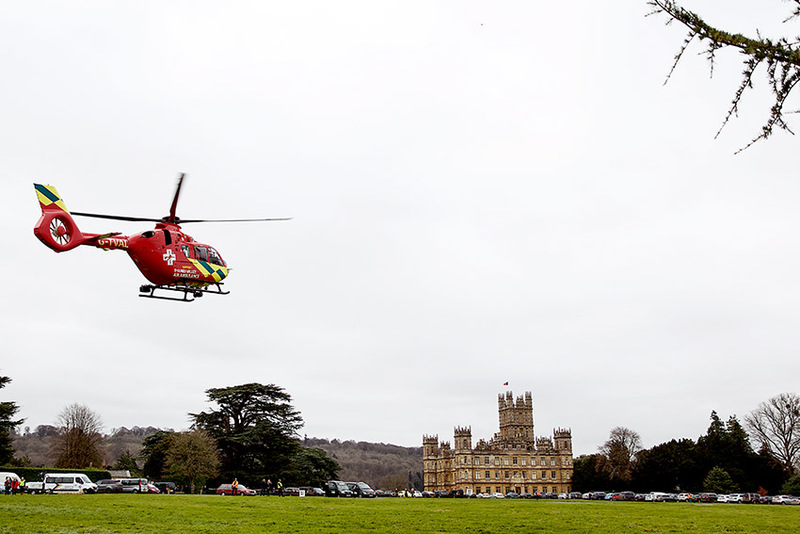 What a joy it would be to visit Highclere at Christmas, may the fair be a great success this year and with large proceeds going to the air ambulance fund. Do tell us more about holidays at Highclered, and we can assume that a new publications is coming soon? I would truly love to be at Highclere Castle during the Christmas festivities. My only concept of Christmas there is the usual Christmas special on Downton Abbey (here in the USA we didn’t get to see it until about March) where we would see the beautiful tree decorated in the main hall. When we first moved to Florida after our return from 3 years in Luxembourg, I ordered a live tree from somewhere in New England. The first tree lasted so long because the tree farm there cut them at the last minute before shipping. We got trees from that source for a number of years but they steadily seemed to be dryer and dryer. Finally we decided on an artificial tree (one of the reasons being a new puppy that we felt might try to drink the water from the tree which is a very toxic substance with the leaf needles falling into it and all). Anyway, I still decorate the 6 foot tree with over approximately 150 ornaments which I have collected during our almost 50 years of marriage. It is so much fun to remember all the places that we have visited on our travels around the world through the ornaments. I even have one of you Highclere ornaments to hang on the tree. Here’s to the most wonderful time of the year, when children’s eyes glow with wonder and adults remember the Christmas’s of their youth. Christmas decor is appearing in our stores here in NY. It is so cozy and beautiful. Our tree is adorned with ornaments that reflect our story over the years. Every year I add a new memory to the tree. We are into it 46 years now. We always choose a tall tree with lots of spaces to fit the ornaments. It takes time but such fun to unpack those joys every year. Our count your blessings tree. God bless you and yours with many joys this holiday season. I JUST REREAD YOUR FIRST BLOG OF AUGUST 13,2013 “A SUNNY ENGLISH MORNING” I WAS SO HAPPY TO REMEMBER THOSE DAYS. THANK YOU FOR ALL. YOUR NEXT BOOK TALKS ABOUT YOUR BLOG?? I hope it reflects the style! I loved reading how you prepare for Christmas at Highclere. Three cheers to you for not decorating until December. I hate how the stores don’t allow each holiday it’s proper time to shine. Why I was in one, the other day, that had Halloween, Thanksgiving and Christmas displays on different isles. Your comment about Geordie’s mortar and pestle made me smile because I can relate to a few of those types of gifts I have received from my dear sweet husband. Oh how I wish I could pop into your Christmas Fare. It sounds magical. It is wonderfully atmospheric – mulled wine and mince pies listening to the choir sing carols. Christmas!! How fun it is to think about and plan!! I have been thinking, coincidentally, about my Christmas gift to my family. I always do a family gift of a museum membership or other activity my family can share throughout the year. I also have them over to my home so we can have our own Christmas together. I have also been considering the idea of having a Christmas Tea to entertain my good friends. 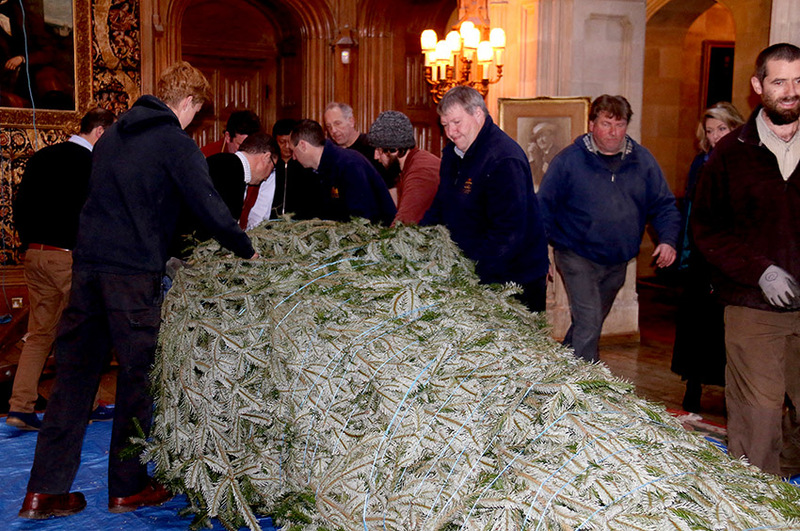 I loved your account of the OVERLARGE Highclere Christmas tree. It was amusing to think of a man on top of the tree!!! As a single lady, maybe I should hope for a man under the tree this Christmas!! 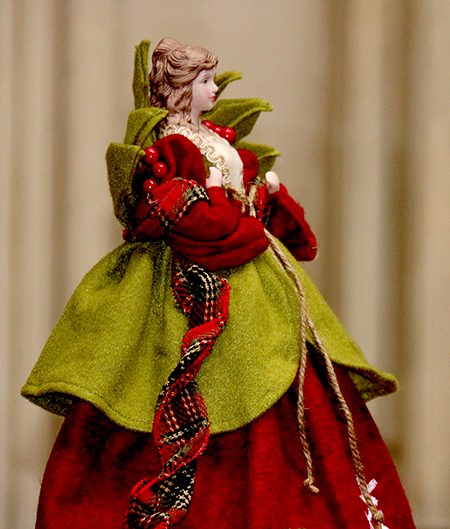 (laughing)The decorations at Highclere are sure to be gorgeous. I also would love to be perusing the wares at your lovely Christmas Fair. Not this year, but someday I would love to attend!!! I think you are like a merry elf spreading Christmas cheer today, and I wish you and everyone at Highclere a lovely and Merry Christmas in advance!! Thank you! I hope you get all you want under the tree this year. I love your blog Lady Carnarvon! I’m sitting in Plano Texas which is just north of Dallas, where it’s raining and finally cooling down. It’s so much fun hearing about your busy day! I actually had my fireplace cleaned in preparation for the first “cool” night! I don’t have to plan like you do, but can’t wait for Halloween, Thanksgiving (sorry) ☺️, and then finally Christmas! Is the beautiful Christmas ornament available for purchase? Mail order? In Australia our Christmas is during our summer. My ultimate dream, which is on my bucket list is to experience a northern Christmas. It’s been my dream ever since I was 10 years old. Now I’m in my 50s…. 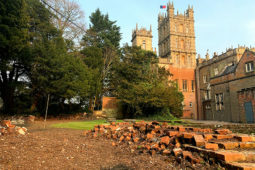 I long so much to visit Highclere Castle which if all goes to plan it will happen in 2019 in August or September. I must look into accomodation at Highclere. Where I hope to meet you when we get there. We look forward to welcoming you here next year. We have two charming Lodges on the Estate in which you can stay for short breaks. We are taking our family to Disney World for Christmas this year, so it is so delightful to read about your Christmas preparations! I hope to put up at least one tree in our home, maybe even after Thanksgiving, just to have a little holiday around before we head to Florida. Have a happy Christmas Lady Canarvon! As I have remarked before, your writing is full of warmth and imagination, truly bringing us all into your home. Thank you! I enjoy your posts, and with my deep love for Christmas, enjoyed this one all the more! God bless you and His Lordship, as you continue your fine stewardship of Highclere! 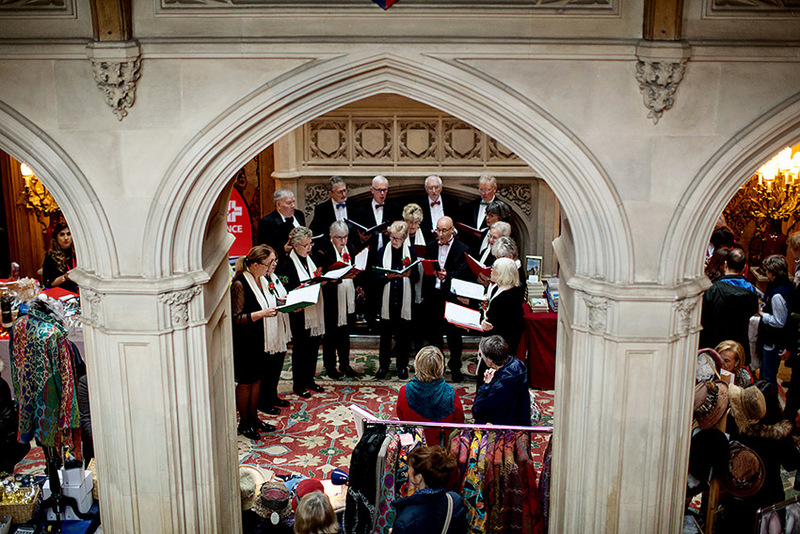 Christmas time sounds magical at Highclere. I just watched the show with Mary Berry and it was wonderful to see your staff who so lovingly help you. I hope to one day go and see all your wonderful paintings! Thank you for taking the time to share these pictures with us! As someone who STILL misses Downton 😉 I appreciate seeing these. What a great caretakers you and your husband are of beautiful Highclere Castle. I hope to visit someday. I hope you will come – we are not far!!! My family and I are coming from the States to visit your wonderful country. How disappointed we were to see that your beautiful home is not open while we are there. We hope to someday see it at Christmas as it must be a beautiful site! What a shame. We are open for quite a few days each December, we hope you can visit us next year. Hello Lady Carnavon! It took a bit of time to catch up after our journey, but I finally got around to sneaking in a read to find out the answer to the Christmas present from your husband. Although well meant, I am glad that he is now avoiding the kitchen wares section when shopping. I only wish someone in my world would host a fair of this sort to assist my with the inevitable last minute shopping that my Dad always heaps on me for my mom. At least this way she doesn’t receive taxidermy as a gift! Thank you again for so graciously opening your house, we thoroughly enjoyed our tour and meeting you. I hope your holidays are filled with joy and the people that make you smile! Thank you. I’m so glad you enjoyed your visit. Just the smell of Gluhwein is so evocative of Christmas.